The 50 State Quarters® Program, the first circulating commemorative coin series authorized by the United States government since 1975, has been met with previously unheard of popularity for a general-issue circulating coin of the United States. The Statehood Quarter program required the Mint to issue five quarters each year for 10 years to commemorate the 50 states in the order that they joined the Union. Each state would have its own commemorative design on the reverse of the coin, along with the date. Statehood and related quarters struck in the Philadelphia and Denver Mint for general circulation were distributed to local banks via the Federal Reserve System. The coins leave the Mint in large 1,000-coin bags, after which they are distributed in smaller quantities such as 40-coin rolls. Proofs from the San Francisco Mint were initially sold directly to collectors either individually or as part of that year’s proof sets. (C) Transline Supply. Do not copy or reproduce without written permission. 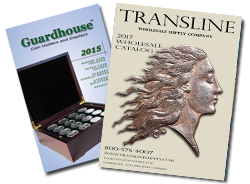 Larger than normal three panel folders from Krause Publications with quality workmanship and extra coins slots. 60 slots. State Quarters -- 1999-2008 one for each state. Produced for the US Mint. Has plastic cups making quarters super easy to insert and remove, while firmly holding in place. Extremely colorful with topographical map, 3 panel fold out. Heavy Gauge vinyl overlay with brass grommets for hanging. Includes slots for territories. Special "push-fit" foam makes it easy to insert your coins. Openings for all 50 states D.C. and Territories. New Compact Size! Display your quarter collection in this educational Collector Map. Special "push-fit" foam makes it easy to insert your coins, openings for all 50 states plus all of the U.S. trust territories & D.C. Compact 9" x 10" Folded, 18.25" x 10" Open. Foam construction is inert and safe for your coins. Heavy Gauge vinyl overlay with brass grommets for hanging - Mount Rushmore on cover. Strong, soil-resistant Whitman albums with blue textured leatherette cover are designed with thumb notches for easy window removal. Album includes District of Columbia and the five United States trust territories: the Commonwealth of Puero Rico, Guam, American Samoa, the U.S. Virgin Islands, and the Commonwealth of the Northern Mariana Islands. Strong, soil-resistant Whitman albums with blue textured leatherette cover are designed with thumb notches for easy window removal. Page for Statehood Quarters Album featuring Page for DC and the five United States trust territories; the Commonwealth of Puerto Rico, Guam, American Samoa, the U.S. Virgin Islands, and the Commonwealth of the Northern Mariana Islands. Strong, soil resistant albums are designed with thumb notches for easy window removal. Every album features a trademark grained leatherette cover. Whitman blue. Strong, soil-resistant Whitman albums with blue textured leatherette cover are designed with thumb notches for easy window removal. This album is for the 2009 quarter releases and includes three openings for each D.C. and territorial quarter. Holds coins from P, D and S mints. Whitman brand, folder opens flat for all-at-once viewing and includes data pertaining to the coins it holds. P&D Mint State Series Quarters 1999-2001, 30 openings. Whitman brand, folder opens flat for all-at-once viewing and includes data pertaining to the coins it holds. P&D Mint State Series Quarters Vol. II 2002-2005, 40 openings. 2006-2009 - P&D Mint State Series Quarters Vol. III 2006-2009. Also has openings for P&D Mint U.S. Territory and District of Columbia 2009 Quarters. 42 openings. Fifty States: 1999-2009. Now includes 56 slots including D.C. and the U.S. Territories.